As soon as Halloween is over, the Christmas decorations slowly make their way out in every store. By the time Thanksgiving is here, Christmas has officially taken over retail, television, and radio. Soon our neighborhoods are also reminders of the Holiday season. It’s hard to leave the house or tune in to anything outside your own bedroom without running into the material and commercial aspect of Christmas. It’s hard enough for parents to stay focused on the joys and the Spirit of Christmas without getting overwhelmed with the Holiday hustle and bustle. But as a mother of five children, I am also concerned with the lessons and the attitudes that my kids take away from Christmas time. Christmas is a wonderful time, one that I look forward to with great anticipation — even as an adult. I remember the magic of Christmas as a child, and the excitement surrounding the mysterious presents under the Christmas tree. But I am also all too familiar with the ever-prevalent attitude of entitlement. When kids begin to expect certain things and complain when they don’t get what they feel entitled to receive, then we know we’ve got a problem. In the 1988 movie “Scrooged,” a comedy version of Charles Dickens’ classic A Christmas Carol, Bill Murray plays a Scrooge-like television executive driven by power and success. So hungry for ratings and control, he schedules a live performance of “A Christmas Carol” to be aired on Christmas Eve itself, causing every employee in the company to miss spending the evening with their family because they have to be at work to participate in the show. In the concluding scene, having just completed his run in with the ghost of Christmas Future, he bursts on to the set in the middle of the live show, in a half-dazed, half-euphoric state, happy to be alive with the opportunity that still exists to change the future. So how do we help our children to experience this Christmas miracle instead of the Scrooge-like grumpiness and entitlement? Instead of focusing on their “wish” lists, help your kids to craft a “giving” list of things that they can make, do, or give to others. As a family, go through the “old” toys and books and pull out things that your kids are no longer playing with, outgrew, or grew tired of. Then think of someone who would love to give those toys and books a new home. Involve children in family activities. Make the holidays more about the things you DO versus the things you get. Set a budget for each person. As the kids are making their wish list, discuss the budget with them. Some kids will take off a large ticket item in favor of getting more little things. Other kids will vote for leaving off the little things in favor of one large item. Let them in on the financial planning part of Christmas shopping. If you are financially able to be a Secret Santa for another family, let the kids shop for the other kids. Let them feel the joy of picking a gift out for someone else. 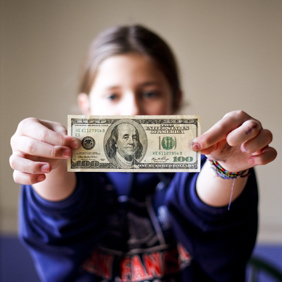 What are your tips for teaching kids the spirit of giving and banishing the spirit of entitlement? I am entering this post in the Good’nCrazy/iVillage post contest for a chance to win one of 2 $100 Amex gift cards.The chances are really good, so cross your fingers for me! 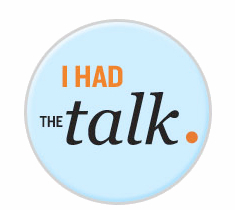 To learn more about how to have ‘the talk’ with your kids about financial responsibility– visit ivillage.com/thetalk, for tips & tools from iVillage. For every “The Talk” Facebook share, iVillage will donate $1 to the Junior Achievement Scholarship Fund! (up to $5,000). © 2010 – 2012, Food Fun Family. All rights reserved. You’re putting your talk into action – that matters. Your suggestions are helpful for younger children and teens. Merry Christmas! Great minds think alike. I just posted about this very thing. Service is such a wonderful lesson to teach, as well as the value of money and the best way to keep/spend it. Yes, focusing on the activities of christmas is what it is all about.